Why Join the Choir? Choir is not just a class it's an experience. 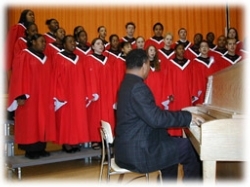 From rehearsals to concerts to contests, choir students take away much more than just knowing the notes on the staff. They become well-oiled musicians with ambition and integrity. Melodious sounds are cultivated from a combination of innate ability and dedication.